The Palos Verdes Peninsula is often enveloped in a coat of coastal fog during the morning hours in June. The fog often hangs around until noon or so then is banished by the sunshine. Some people are happy to see June replaced by sunnier Jul,y but I enjoy the coastal clouds even when they are close enough to the ground to be considered fog. Photos taken on a gray day, especially of the ocean, reflect the weather condition of the day, often in an unexpected way. 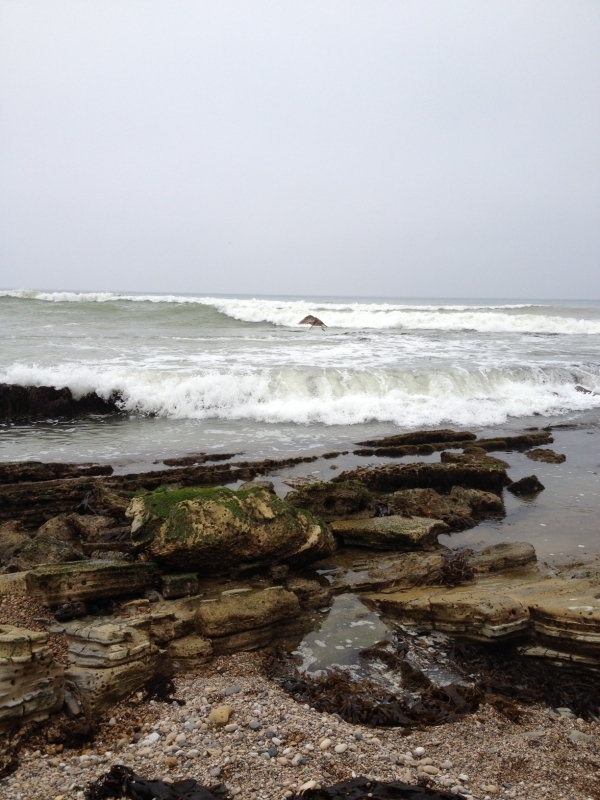 I snapped this photo while walking along the ocean's edge in Rancho Palos Verdes. I love the subdued neutral colors. Palos Verdes is a beautiful place whether the sun is shining or June gloom is hovering over it. For more information about the Palos Verdes Lifestyle and the local real estate market, contact Norma Toering at 310.493.8333. To Stage, Or Not To Stage? That Is the Question. Did Zillow Price My House Right?